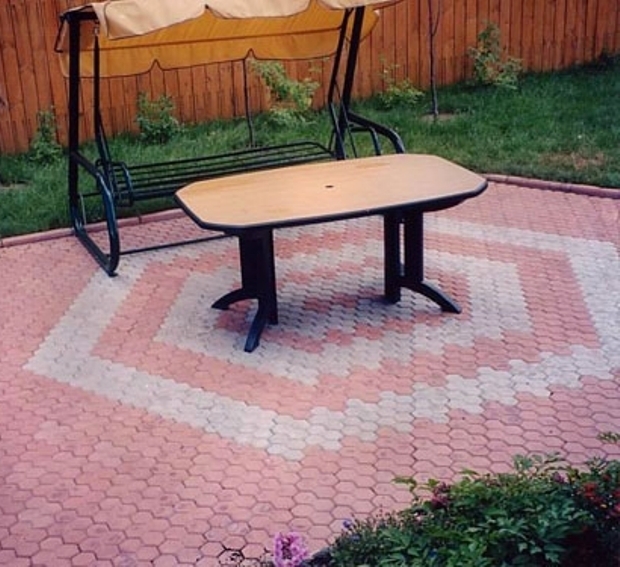 To lay paving, you must complete several steps. Important when laying – exact adherence to the technology. Inaccurate or incompatible technology will lead to the destruction and undermining of paving materials and to the formation of irregularities on the surface of the sidewalk or road. Before starting the installation, determine the color scheme, select a song from several colors of pavers, determine the shape, direction and size of the site, understand for yourself how pavers will blend with the landscape. Define the scope of work for laying pavers. If you are planning to lay paving a large area, it alone to do it will be difficult, will definitely need helpers. But to put the path to the front porch or small area, you can take on alone. Make the layout of the site. First, determine in what direction should lead paths or sidewalks, which are paved. Plan area or track on the ground, draw the contours. On the bends and curves of the track drive in the pegs, pull on the ground level with the string. Prepare the track. Topsoil clear to a depth sufficient to accommodate the lining of sand and gravel and block paving. The thickness of the lining is chosen based on the estimated load on the pavement. Before laying sand-and-gravel seal the land. The application of the carrier layer is not required if the soil in the laying of sand. Lay the lining layer. For the carrier layer, select a uniform material which will be resistant to low temperatures. The bottom layer place gravel on top place a layer of sand. For greater strength, you may need a third layer made up of a mixture of sand and cement. The next stage of work on the paving – rammer. Use the handy tools or special tamper made of cut logs, to which are nailed on top of the crossbar. Along the contours of the track, put a border of plastic to lining not parted to the side. If you want to achieve a perfectly flat surface, use a plate compactor, which is a wonderful seal coating. The final stage is the actual laying of the pavers. To carry out packing carefully, without haste. Start from the bottom track to the top or from the main landscape elements (porch, main entrance to the building) to be less significant.